The versatility of the 20 Tons Horizontal Press Brake QUANTUM NARGESA PP200 allows us to bend, fold, cut and shape in cold, stretch and reduce, inlay, notch and assemble... Horizontal Bending Press Brake PP200 has been manufactured in a 60mm thick welded steel monoblock, stabilized and mechanized. Its robustness, versatility and easy handling are just three of the best features our hydraulic horizontal bending machine has. Folding flat bars and sheets into completely close shapes. Conception of this horizontal bending press brake allows to make folding operations that are impossible to be carried out on a conventional press brake. Fast tool change, punches and dies: This change does not take more than 30 seconds most of the times. STANDARD EQUIPMENT PROVIDED WITH THE MACHINE: Horizontal press brake PP200 includes the complete 4V’s folding die. Folding or bending die up to 100mm with 4 openings (16, 22, 35, 50mm) and a punch of 88º. This multi-V die allows 1mm up to 8mm sheet to be folded. The 70mm outer die¡ameter punch allows to make completely closed shapes to a minimum of 75mm inner wing. Folding punches to bend special pieces of small sizes or folded up to 30º. WEIGHT: 3Kg each unit approximately. Flat bar and metal sheet cutting die up to 100mm through a maximum thickness of 10mm in mild steel. At Nargesa we own a wide catalog for punches and dies of all kinds. If the size the customer needs is not in the list, we manufacture it. In the PDF file you will be able to see all kinds and sizes we have. Punch holder for all kind of punches for Promecam bending or folding press. Compatible with any Promecam punch. Promecam punches of different shapes to bend and manufacture complex part. There are a lot more shapes, please consult the manufacturer. Promecam dies of different openings to fold sheets, flat bars or thicker plate sections up to 15mm. in order to fold even thicker sizes, ask the manufacture. Die to reduce and expand the pipe ends to be assembled. You can make all kinds of shapes and flaps according to the customer needs. For special forms consult the manufacturer. MAXIMUM CAPACITY: 60x2mm or 2"
Dies for notching pipes from Ø16 to a Ø60mm. It crops the pipe end so it could be joined perpendicularly to another pipe. In the PDF file you will be able to see all kinds and sizes we have. Die to form rings or English banister railing, used as ornamental piece in forging railings, gates, fences, etc ... for bars bonding. For other sizes and applications consult the manufacturer. For different sizes, please ask your sales engineer. Die to bend or fold different profiles such as U, T angle etc… with other specific radius and degrees. Technical drawing or sample pieces are required. Tool used to bend straight profiles or parts. It is adjustable to different capacities according to the profiles. Tool to bend square pipe or bar at given or specific degrees. Technical drawing or sample pieces are required. MAXIMUM CAPACITY: 50mm o 2"
Die to form all kinds of clamps. This tooling is manufactured according to the user’s needs thus it is required to have a technical drawing or a sample piece. Die to manufacture hinges depending on the customer’s requirements. Technical drawing or sample pieces are needed for the manufacturing. Tool to fabricate all kinds of tabs, with or without perforation, straight or rounded... they are very used as clamps, handles etc. Starting from a metal strip, there will be obtained one piece of the desired length at every stroke. In the PDF file you will be able to see all kinds and sizes we have. Punch-holder die, compatible with our NARGESA brand punches. It will always depend on the thickness to be pierced. Die to get metal sheet corners rounded at different radius. In the PDF file you will be able to see all kinds and sizes we have. Die to form curves in flat bars, pipes, bars or profiles at big radius. It’s perfect for bending small series or special parts without requiring a specific custom mold. MAXIMUM BAR CAPACITY: 40mm or 1 1/2"
MAXIMUM PIPE CAPACITY: 80x80 mm or 3"
MAXIMUM DIAMETER: there is no maximum. Clamp forming die, used to manufacture the clamps used to join different forging bars with no need to get them welded. It is an exchangeable fitting device for the forming dies, suitable for each of the different baluster forming tools. It is advisable to get one in order to work with the specified dies. Die to form cold forging balusters for grills, gates, fences, handrails, etc... For other shapes or capacities, request the manufacturer. Die to form cold forging balusters shaped parts for grills, so called “belly top railing”. For other shapes or capacities, please consult the manufacturer. Before you buy a Horizontal Bending Press Brake you should know about the difficulties that exist when fitting the non-standard folding, bending or forming special parts dies. Sometimes there are facts that make it for customers hard to invest in a complicated tooling when customized pieces must be made, tight lead time, the small number of parts to be manufactured or lack of budgeting. The advantage of the Horizontal Bending Press PP200 is to have a really simple head drive so that all our customers can adapt any die manufactured by themselves. To add more options when fastening tools, the workbench has a series of clamping holes distributed throughout the area to ease up the fixing. If you need a special die, Prada Nargesa offers a technical support to all our customers who wish to make their own tools. Moreover, we have an extra service for designing and manufacturing exclusive tooling on request, for each of the machines we manufacture. 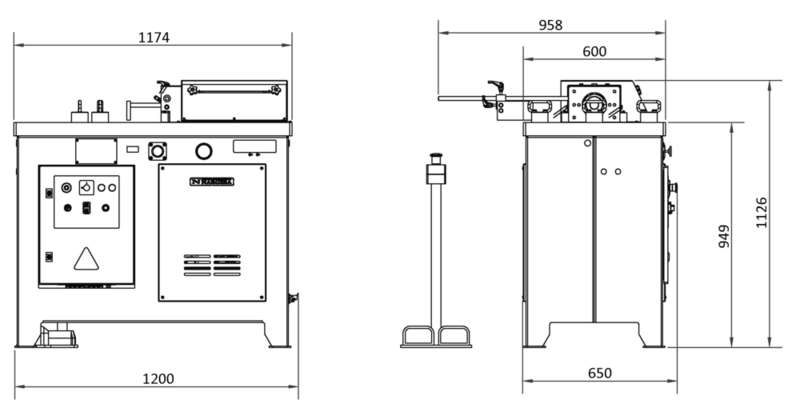 Dimensions of the machine: 958x1200x1126 mm. There are multiple uses for the Horizontal Bending Press PP200 NARGESA. The large number of tools that complement it allow several operations in different materials and in different types of profiles. Bending and folding flat bars with horizontal press will enable the manufacturing of completely closed pieces that would be difficult to obtain by using other machines. Bending and curving tubes to different degrees to make tables, chairs, pool ladders, car protections, parking lot protections, fitness machines etc ... Straightening and bending large profiles to conform bus chassis, prototypes with complicated curves and bends, straightening faulty profiles ... Cutting flat bars or metal sheets a lot faster than any other saw or cutting machine. Punching, boring, drilling or punching plates to make perforations on fences, doors, windows and other parts. Cutting and shaping are other features of this versatile forming press for manufacturing flanges and clamps for fastening pipes. Flaring tube or pipe for assembly and subsequent welding to produce exhaust pipes, water pump distributors, metal furniture, railings tube... Widening and reducing the pipe ends permit joining different pipes to make berths, chairs, irrigation systems, tents, greenhouses etc... Folding and bending solid rods will enable the user to manufacture all kinds hooks, chain links and also form balusters out of square or round bars, tubes for the manufacturing of parts for cold forging, railings, fences, gates, doors, railings... Making hinges is another widely used application in this type of hydraulic press. As you can see, the uses of Hydraulic Horizontal Bending Press Nargesa PP200 are really limitless.